When I was a kid, the only thing I knew about Budapest was from a song in the musical CHESS, which talks about the 1956 Budapest Rising. That was pretty much it, apart from a barely remembered weekend break there about fifteen years ago, where all I remember visiting was a restaurant called ‘Sir Lancelot’s‘, where we had a literal shield filled with meat for dinner. So, when the Central European University invited me to lecture to their students, I was more than willing to agree, even though it was the week after Chicago, and I was only just fighting off the jet lag. I’ve done things like this before, and people often tell me how lucky I am to be able to visit such amazing places – my British Council 2009 tour of India comes to mind – but the fact of the matter is that nine times out of ten there simply is no time for touring; you arrive, check in, do the talk, sleep and then go home. Or, you’re confined to a hotel miles from anywhere for the duration. Neither of which are fun. 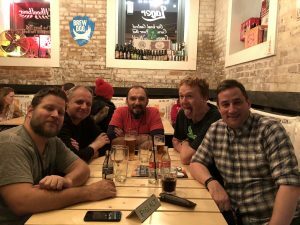 However organisers Ian Cook and Anna Orosz made sure this wasn’t the case, as on Monday when I arrived at about 5pm, after a chance to freshen up I was picked up by Ian and taken to a local bar where I met some amazing Budapest artists and publishers for a relaxed, informal drink. And on the day itself, I found I had a good few hours before the 3pm pick up to walk around Budapest, taking in many of the sights – and as ever, being a firm believer that you don’t know a city until you’ve gotten lost in it, I made sure I did just that. 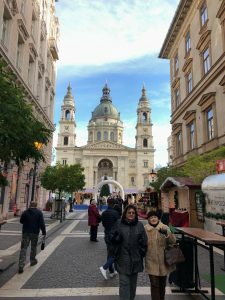 Budapest is a beautiful, if conflicted city – and just before Christmas it takes on a shine, with a Christmas Market outside St Stephen’s Basilica, one of the most beautiful churches I have ever seen – and I’ve been to all the ‘greats’. The people are friendly and always happy assist, there’s a feeling of ‘just get on with things’ that I like. And for a change the weather was quite pleasant, the snow of the previous day replaced with warm winds. In fact the cool air was nicer than my hotel room, which (due to a broken air conditioning issue affecting many rooms) was stuck on 27 degrees celsius. Monday night – Gyula, Tony, Dávid, Ian, me. The talk was well attended and hopefully well received – ‘Using Graphic Novels To Communicate Your Research’ isn’t a topic I’d usually write or even talk on, but after the Sociologists Review talk in June, I’m realising that there’s a definite niche market for this, so who knows. After the talk the University took me to dinner in a local restaurant where I learned that Anna is also the translator into Hungarian for many John Le Carre and Neil Gaiman books. And Gyula Nemeth, an artist I met the previous day attended and presented me with an incredibly designed version of HG Well’s THE ISLAND OF DOCTOR MOREAU, which now sits in pride of place on my bookshelf. For the final day, it was a little more relaxed – I had a screenplay deadline so worked on that in the room, bar a couple of breaks to wander the local Christmas Market and buy some last minute gifts. Then it was off to Budapest airport for the long journey home. My surprise ‘thing of the trip’ however was my new water bottle. Sick of the round flask I’ve had for a couple of years now knocking things or falling out of the bag, I’ve bought an A5 Memobottle – it’s basically a bottle shaped like an A5 sheet of paper, about an inch deep, and can hold 750ml of water within. It’s slim and can fit in any bag – and was perfectly sized for my carry on. Definitely something I’ll be using more in 2018. And now I’m back in the UK, and back working on a variety of different projects. Already yesterday in Budapest feels like a distant memory. But this time, I know I’ll remember it, and the people I met for far longer.